On 12-14 October 2015 the annual meeting of German Museums Association took place at Konrad-Zuse-Zentrum für Informationstechnik. The event was attended by professionals in the museums and museum documentation sector and it was a huge gathering of about 230 attendees; a perfect occasion for partner SPK to present Europeana Space, the Museums Pilot and its outcomes: the Toolbox and the Blinkster app. 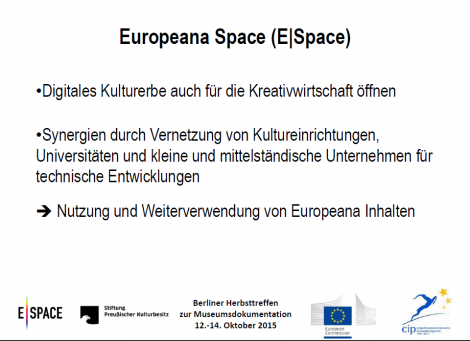 An extensive presentation by Marlene Scholz (SPK) and Beatrix Lehmann (Museummedien) discussed E-Space in general, the pilots (with a focus on Museums pilot and TV pilot), the Technical Space and WITH tool and the functionalities of the Blinkster app and of the Toolbox (presentation in German available here). During the event it was also possible for attendees to test the Toolbox on site and it was a very useful moment of exchange and evaluation with the main target group of the Museums pilot.